For your graduation ceremony, enhance the sense of achievement and success with pink graduation stoles! When you make your purchase with Honors Graduation, you can feel assured that you are receiving not only the highest quality in our beautiful crepe back satin, but also the most affordable price, especially when you take advantage of our fantastic bulk discounts! Students are sure to feel dignified during their important commencement day as they wear this symbol of achievement. There are a variety of ways in which you can integrate meaningful uses for your pink honor stoles at your school's graduation ceremony. They may indicate participation in specific clubs or leadership positions. They can also be used to show academic honors through high grade-point average. On the other hand, pink may simply be part of your school colors, and if this is the case, you also may be interested in presenting pink honor stoles to all your students to be given as "stoles of gratitude." In this heart-warming commencement tradition, students wear their honor stoles throughout the graduation ceremonies, and then afterwards present them to a mentor as a token of gratitude for enabling their achievements of the day. Your uses for the pink graduation stole can also be reflected in the symbolic color meanings. On the college degree level, pink represents accomplishments in the area of music. Additionally, the color can denote friendship, so if your school has any particular honors or leadership that connect to that attribute, your pink honor stole can help recognize this strong characteristic! However you choose to use honor stoles in your school, you can count on Honors Graduation to meet and exceed all your needs! 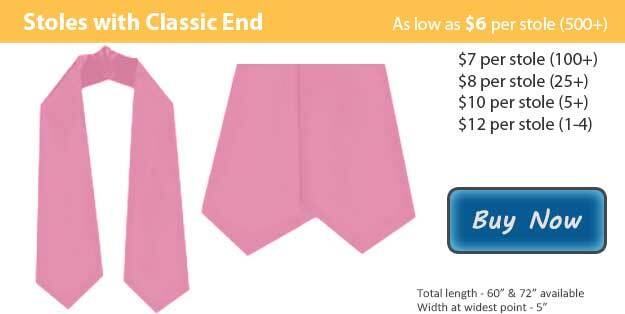 Place your order for pink honor stoles today, and don't forget to ask about our terrific bulk discounts! We also offer tassels, cords, gowns, and more!